This book explores and presents the influence of contextual factors on the choice of electoral systems for parliamentary elections in both democracies and non-democracies around the world. Taking a macroscopic approach, the author focuses on structural explanations, with an emphasis on general patterns rather than country specific explanations. Drawn from a wealth of data, the book presents the frequency of the adoption of each electoral formula and system in the postwar era and is followed by a theoretical elaboration of electoral system choice. The author then draws on rational, cultural/historical and institutional theories which are systematically analyzed by means of sophisticated bivariate and multivariate techniques. 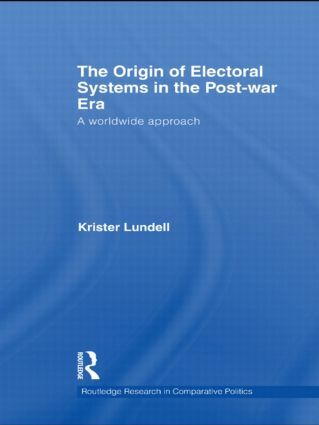 Lundell demonstrates that few electoral systems have been chosen from rational considerations and the impact of the cultural and historical setting is tremendous; colonial legacy, regional influence and temporal trends largely explain the cross-national variation in electoral systems. This book will be of interest to students and scholars of political science, electoral politics and comparative politics.